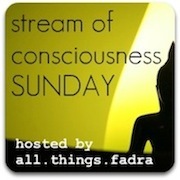 Every Sunday, a most fabulous blog all.things.fadra hosts what she calls a "stream of consciousness Sunday" where bloggers simply write for five minutes and don't look back. No editing, no spellcheck (I should be good because I never do that anyway). The topic/writing prompt of today's Stream of Consciousness is "How did you spend your Sunday mornings growing up? What are some of your favorite memories?" I am so good at remembering. I am the go-to girl for all things remembering in my family. "What is that show that mom never let us watch when we were kids?" "The Newlywed Game." Too much talk of making whoopee. "Where did we go out to dinner when the tax return check came in the mail?" Ooh, I know, ask me....Mr. Steak." "What was the name of that group mom and dad loved and wouldn't stop playing their records?" Supertramp, of course. My siblings and even my dad know to come to me if they need something remembered from our family's past. So, why can't I remember Sunday mornings. Maybe because they weren't anything special. I remember long breakfasts, sometimes church, most likely not though. I remember long, elaborate Barbie storylines that my sister and I would steal from Falcon's Crest and Dallas. We would literally play for hours and sometimes get so invested we would both cry. Oh, the drama. But there was no routine to our Sunday mornings as kids. And looking back, that was pretty cool. No routines, no structure, just time to hang. Time to play and let our imaginations go crazy. Time to relax and time to get ready for the week. I never really give my parents credit for doing a lot of things right, but man, those Sundays sound so good right about now. You have plenty of memories! It just wasn't a routine. We actually were never a routine family either. I had to laugh because my mom wouldn't let me watch Three's Company. Too many sexual overtones, I suppose. She was right but I still wanted to watch it. And my sister and I also had elaborate storylines but I don't think we ever cried. That's hilarious!